Everyone – thank you SO MUCH for attending the 7th Bugeater this past weekend. We raised a little over $3800 for the debate programs. 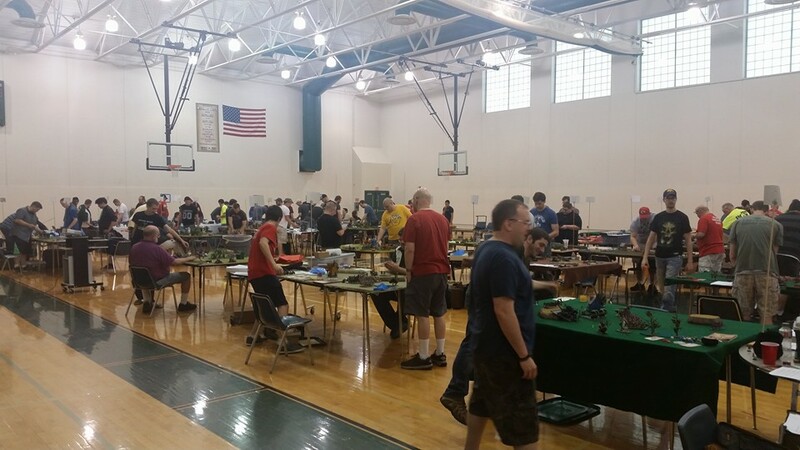 We will start with the results from our largest event – the 40k GT. We report results in two ways – overall results that factor in battle record, painting, and sportsmanship; and battle results that only look at win/loss/draw and battle points. For purposes of the ITC we submit the *battle* results. So the rankings you see on the battle results pdf are what we turn in. We will submit scores to the ITC in *TWO* days. Please make sure your name and club are correct so you get credit for your results. Once 8th edition has had some time we will send out a survey to get player input on what you would like to see. In the meantime, thanks again for coming to Bugeater #7. We hope to see you again at Bugeater #8! We are excited to see everyone at Millard North (NOT West – remember that! West is closed for construction this year!) in a month! Tickets are still on sale, so make sure you get yours before coming! Everyone attending a multiday event will be getting a Bugeater swag bag and a free entry into the Golden Gobbo painting competition. Everyone getting a bag will receive the Bugeater GT 2017 patch and the Bugeater 2017 custom dice, plus at least one other item unique for their game system. We have some exciting announcements over the next few days to get you hyped, along with some important information about specific events. Keep an eye here and on our facebook page! X-Wing, Dropzone, Dropfleet are now live! Folks, tickets for our first ever events for X-Wing, Dropzone Commander, and Dropfleet Commander are now online and ready to go! Check out the links for event details. Folks tickets are on sale for almost all of our events (X-Wing coming soon!) so grab your tickets today before events sell out. We are excited to have another full slate of events this year, including the inaugural year for Horus Heresy and X-Wing. We are excited to be adding Horus Heresy to the Bugeater! We are having several one day events that all tie together as part of a 3 day narrative campaign: the Conquest of Marnex IV. The basic information on each of the events can be found here. Loyalists and Traitors are both trying to conquer a Forgeworld that has declared its independence in the midst of the Heresy – Marnex IV. Saturday players can participate in a 3 round, 2500 point friendly tournament. Sunday players can participate in EITHER several missions or Zone Mortalis OR they can participate in two multiplayer battles representing the final war zones of the campaign (both events happen concurrently and influence one another). We will be slowly rolling out our primer packs for people to check out. Today we our releasing the primer pack for our 40k GT. Please contact us if you have any questions or concerns. By next week, we will have the tickets online for you to purchase! Here we are folks! The week of the event! If you signed up for the 40k GT or the Kings of War tournament you should have received an email from me. If you did NOT, please contact me (tdroyers@mpsomaha.org) ASAP. Bolt Action folks should be in contact with Josh Dunn. Infinity folks either have already heard from or will hear from Chris Douglas fairly soon. Warmachine players – if you have any Qs or concerns, you can talk to Dan Sammons. If you’re not sure how to get a hold of those point people, email me and I will get you in touch with the right people. 1) Friday night, starting at 6, we will open up the space for you to come in and get some open gaming in. There are some folks planning on playing some Battlefleet Gothic, so if you’d like to join in their fun talk to Cory Gage! 2) Please pay close attention to your check in and round one start times for Saturday. They are posted on the website, and if you have any questions please contact me. 3) If this is your first Bugeater, do NOT use the main entrance to the school. A church meets at the school on Sunday, to avoid any issues with heresy and straying from the light of the God Emperor (or Menoth depending on what game you’re playing), we just use the north entrance on both days. We’ll have a banner up near the entrance so you know you’re headed in the right direction. 4) Remember that if you’re playing in ANY of our events, you get a free entry in our painting and modeling competition, the Golden Gobbo. You may use models from your army (or not – they don’t even have to be from the same game system you’re playing in!). Check out the Bugeater website for more info. You may also purchase additional entries for $5, but we cap it to one award per person (so additional entries just give you more opportunities to earn AN award, not multiple awards).